Kindness, Inclusion, and FUN for Kids at VBS This Summer! Just wait...it’s coming! This Summer at Asbury First is a Vacation Bible School unlike none other! We focus on kindness, inclusion, and—most importantly—FUN. VBS takes place at Asbury First United Methodist Church on August 6-9 from 9 am-12:30 pm. Our development team is hard at work to plan four incredible mornings, PLUS a family night filled with activities, games, drama, music, science, and lots of wacky fun. We keep the cost for families low so that all can attend. The cost is $15 per child (with $40 maximum for families, no matter how many kids join us). All children ages 4 through 5th grade are invited to take part this wonderful experience! Please click here to subscribe to VBS and Children’s Ministry updates to find out more as we draw closer to the event! We are Faithfully Expanding our Sunday Streaming Technology! Join a matching donor and give to upgrade our HD streaming technology! As we look for new ways to engage our online community, we have an exciting opportunity to upgrade to HD technology for our streaming ministry. This project costs $20,000. Thankfully, we have a matching donor who has committed $10,000 if we can raise the other half of the funds. An additional $6,000 has already been committed, which means we are $4,000 away from funding this project. Now, we need your help! Please join us and give to the HD upgrade by clicking here and designating your gift to “HD upgrade.” Together, we will continue to faithfully grow and expand this important ministry tool. Join Us for Wednesday Evening Group Studies! Each month, a minister will offer a new study. See topics & descriptions below! Childcare is provided for class time, and please feel free to join us at our Community Dinner at 5:30 pm in the Gathering Center! 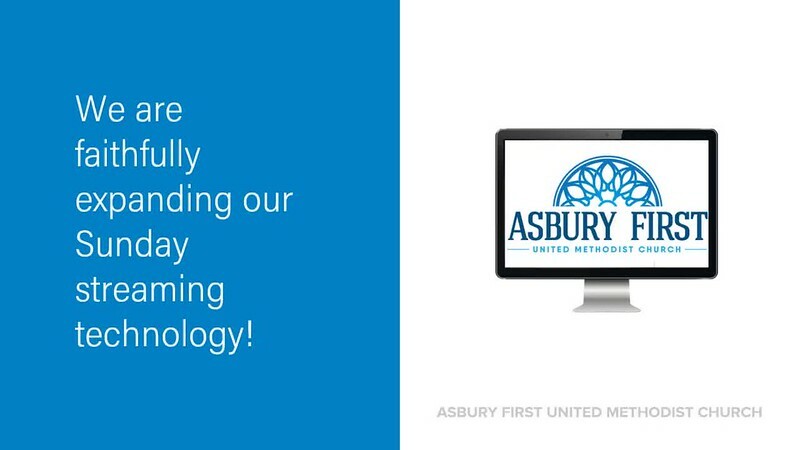 You do not need to be a member of Asbury First to join in—all are welcome! Come join us as we learn about the history of oppression in the United States. We will unpack white privilege, systemic racism, and environmental injustice to better understand what we are called to do as Christ-followers in this deeply divided nation. During the Wednesday evenings in the Season of Lent, please join us for an exploration of the ancient biblical and theological understandings of prayer and to explore these understandings and implications for our own prayer life. This will be an opportunity to discover new practices of prayer and deepen our own prayer life. *Dates have changed and are now March 14, 21, and 28. During this class, we will tackle what it means to be faithful to our mission while addressing the realities of poverty in this community. We will also look carefully at the long-term viability and effectiveness of our ministries. Following this series, Robert Lupton (author of "Toxic Charity") will be visiting Asbury First during the month of April to offer a presentation on his book. We invite you to come and learn how we, as people of faith, can be advocates for people living with mental illness and bring about systemic societal change in regards to mental health. We will start our study with a visit from David Finnegan-Hosey, author of "Christ on the Psych Ward." Are you sick and tired of stressing about finances? Do you find yourself trying to scrape by each month until the next paycheck comes? If so, then you are like 72% of Americans living paycheck to paycheck. It’s time to break the cycle and take ownership of your finances. Join us for nine Sundays starting February 18 (through April 22) from 9-11 am here at Asbury First on the second floor of Building 1010. Financial Peace University is a 9-week course that focuses on how to manage your money in a way that honors God and principles we find in the Bible. Enrollment in the class costs $109/household, which pays for your workbooks, textbook, and online resources. The course is taught through video by Dave Ramsey, and class discussions give it, and you, accountability. You will be challenged in the waysyou have always done things, learn to communicate with others better and create a plan to put you on a path toward financial freedom...The fall class paid off over $16,500! This Genesee Valley District Leadership Training Event will be held at Asbury First on Saturday, February 3, 2018 from 9 am-4 pm. This is the District's annual Leadership Training Day, which offers a variety of workshops for which you can register. Lunch will be provided! Registration is $20. To find out more, read below. Please contact Pat VanVleck at (585) 355-1035 with any questions that you may have. What is Informed to Transform? Informed to Transform is for everyone—clergy and laypersons, leaders and those looking to lead, those who are spiritually enriched and those seeking more. Where did the name Informed to Transform come from? The name came from the desire to fulfill the Mission: "Making disciples of Jesus Christ for the transformation of the world". In order to Transform, we must be Informed about the teachings of Jesus Christ—as well as the workings of our church. The goal of this event is to help all in attendance be more informed and educated in a way that prepares them to transform our world. Volunteer in Missions Coordinators helping you discover God's call on your life through disaster response, mission and service. A special opportunity in the morning session to participate in Hands on Outreach at Asbury First in our Dining and Caring Center and Storehouse. Each year, United Methodist churches are required to gather their leadership together to accept bequests, affirm candidates for ministry, set the compensation package for the staff, elect the leadership slate for the next year, and review the proposed budget. This is called a charge conference and includes only selected members of the leadership of the church along with retired clergy. At Asbury First, our tradition has been to hold an annual church conference which preserves the same functions, but is open to all member of the church. This is a time for us to celebrate our successes together and to address any potential challenges. Thanks for joining us this year! Watch the Conference Video Here! Worship With Us This Holiday Season! A Service of Poetry, Word, and Carols. A Service of Word, Carols, and Holy Communion. A Service for Families and Children featuring the Children's Pageant. A Service of Word, Lessons, and Carols. A Service of Word, Carols and Holy Communion. Come and go as you wish. Like most of the world, I watched the news from Sutherland Springs this week with sadness and horror. My heart breaks for the people of that small community and for children (mine and others) growing up in a world where this kind of violence is a reality. I am ashamed of the communal cycle of outrage and paralysis that has too often accompanied these sinful acts and mourn our society's inability to have honest conversations about guns, mental illness, public discourse, or even truth itself. Those of us who proclaim the Prince of Peace have an obligation, both Christian and moral, to seek out the root of this evil. We must not allow ourselves to be numb to this new reality. This means confronting gun violence. This means dealing with mental illness. This means looking in the mirror and facing the violence and derision in our own lives. We can do this, but we will have to do it together. Over the next few months, we will be working as a congregation to provide forums to practice peace together--forums to have honest conversation about these communal challenges. In the end, there is no way to plan for every eventuality. All of us will have to do our best to safeguard our congregation while maintaining the spirit of Christian hospitality endemic to Asbury First. This is a sad week for all of us, but our call to Christian love and hospitality has not changed. We are a people who proclaim hope in despair, light in darkness, and life in death. No act or threat of violence can change our proclamation or our commitment to God's truth. This Sunday, as we do every Sunday, we will gather to love God and neighbor, to live fully, and to serve all. By God's grace, we will never stop. See you Sunday. Pipes and Pistons: Baroque Music for Trumpet, Voice, and Organ will feature multiple concerti, sonatas, and arias by superb Baroque composers. Selections will include Vivaldi’s famous “Concerto for Two Trumpets,” arias by Handel and Scarlatti, and Franceschini’s “Sonata for Two Trumpets.” The events are free and open to the public, and free will offerings will be accepted, with all proceeds benefiting the vibrant music programs at local churches. The first performance will be held at Asbury First United Methodist Church on Friday, October 27 at 7:30 pm, and the second is featured at First Presbyterian Church of Pittsford on Sunday, October 29 at 3 pm. The events are a collaborative presentation by local musicians. Trumpeter Brett Long will be joined by fellow Nazareth College faculty, Kimberly Upcraft and Susan Cotroneo, on several soprano arias. They will be accompanied by Bruce Frank, organist for First Presbyterian Church. Max Matzen, trumpet professor at Utah State University, will also be featured on multiple selections.